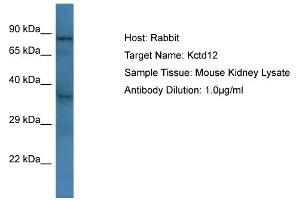 Characteristics This is a rabbit polyclonal antibody against Kctd12. It was validated on Western Blot. Background Kctd12 is an auxiliary subunit of GABA-B receptors that determine the pharmacology and kinetics of the receptor response. It increases agonist potency and markedly alter the G-protein signaling of the receptors by accelerating onset and promoting desensitization.